The Federal Open Market Committee (FOMC) announced their decision to leave the $85 billion monthly bond-buying program unchanged for now. This action countered consensus expectations the Fed would begin tapering asset purchases to $70-75 billion per month, but the restraint aligned with the Fed’s lowered economic guidance. While acknowledging steady, broad-based economic growth, the Fed’s statement cites lingering concerns about the effect of fiscal tightening, the depressed level of labor force participation, flat wage growth, and the impact of higher mortgage rates on the housing market recovery. Despite the downgrade of its view on current economic conditions and lower expectations for the near-term outlook, the Fed’s decision to maintain the quantitative easing (QE) program rallied both equity and bond markets. Since the latest round of QE last year, the U.S. unemployment rate has declined 80 basis points to the current 7.3 percent. In addition, staying the course will reinforce downward pressure on longer-term interest rates, which had advanced 110 basis points from the start of this year. The Committee issued interest rate guidance of maintaining a 0.5 to 1.0 percent federal funds rate at least until mid-2015, before rising to 1.5 to 2.0 percent in 2016. The Fed will require additional evidence that the modest pace of economic growth can be sustained before they begin slowing their pace of asset purchases. The Fed further reiterated that tapering would begin once the economic and employment recovery is well established, and noted any tightening would occur at a more gradual pace than historical precedent. The Fed’s decision to maintain the status quo certainly bolsters the mortgage market, but does little to alleviate uncertainty in the economy. 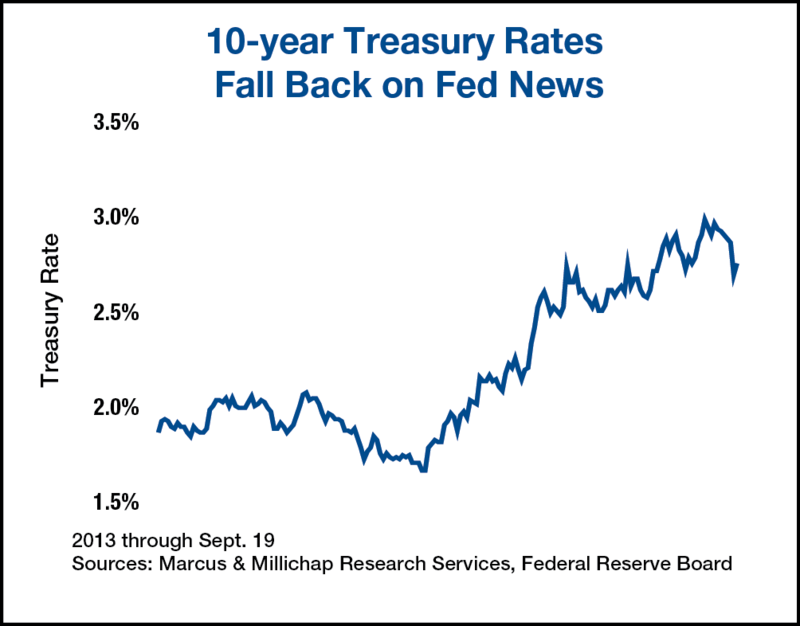 With Congress set to spar over the debt ceiling in less than two weeks, a new Fed chief coming on board, and renewed conjecture as to the start date of tapering, the capital markets will likely prove volatile through the end of the year. The residential sector normally contributes significantly to economic recovery and growth following a recession, and the Fed’s decision not to slow its quantitative easing lends continued support to the mortgage market. High underwriting standards remain hurdles for both consumers and businesses, but financing conditions have eased, and expanded access to credit is requisite for a sustainable economic expansion. A continued accommodative lending environment will aid in the refinance and restructuring of maturing loans and more capital will favor real estate as a comparatively sound alternative to low-yield bond and volatile equity investments. The increase in mortgage rates over the past year has rippled through commercial real estate transactions by significantly increasing financing costs, particularly for non-core assets in secondary markets. A more liquid credit market will broaden opportunities for investors over the short term, but interest rates will continue to face upward pressure over the long term as the economy gains momentum. This entry was written by marcusmillichap, posted on September 20, 2013 at 8:26 pm, filed under Uncategorized and tagged CRE. Bookmark the permalink. Follow any comments here with the RSS feed for this post. Post a comment or leave a trackback: Trackback URL. Someonne essentially assist to make seriously articles I would state. this particular post extraordinary. Magnificent job! We’ve ever arrive across on this subject. Actually Wonderful.